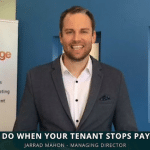 In this Perth Property Market Update Jarrad Mahon from Investors Edge Real Estate goes deep into the sale market, rental market and property investment opportunities… Answering “What Now?”… watch it here or read the transcription and graphs below. 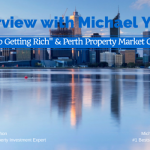 Good day, Jarrad Mahon from Investors Edge Real Estate, bringing you my latest Perth Property Market Update where I’m gonna try to answer to you the question of “What Now?” for the Perth Sale Market and the Rental Market? So, let’s get stuck in to it shall we? We’ve got the election out of the way, we’ve have had an interest rate drop last week. So things are starting to get a bit more stable and positive for the economy. But what are the stats telling us? Let’s launch into the Sale Market. Now, where we were at on things is the number of properties for sale have gradually been dropping as you can see in the graph to the right. And what happened over the last three months is we’ve seen less people coming on the market and people have been a lot more realistic about their sale prices. So, while we haven’t been getting more sales per week, we’ve seen a lot of people hold off from selling and gradually that number for sale has been dropping, that’s a positive sign. And over the last six months, we’ve actually had a 7.25% decrease in the number of properties for sale, so that’s a positive! Over the last year since August, we’ve had a 2.83% increase in the number of properties for sale. So, we’re still coming back to where we were last year but the number for sale is certainly decreasing and a positive note for us. When we actually look through to the number sold is referring to, there is a gradual downward trend in the number sold and we’re actually still having less sold compared to six months ago so we’ve had a 14.35% decrease in the number being sold each week and it’s down 13% on last year. So, until I see this number being sold per week increasing, I’m certainly not calling any bottoming out of the market. I think the reason that our number for sale is decreasing is really just coming down to people being realistic. I believe we’ve got another 3 to 6 months before we bottom out. And then probably another 6 to 12 upwards or 18 months while we trend sideways. Now that said, different suburbs will be performing better in the market and different suburbs will be performing worse. So it’s a case of looking case by case and there is always opportunities for growth and suburbs to stay away from. So we can help and advise you on your specific situation. Now the days on market, you could see that it was gradually, in the graph, starting to come down. 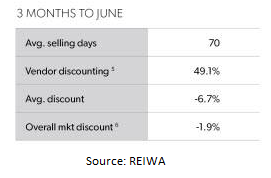 And then in the July quarter, it shot back up again so we’re now at just over 70 days, on market average. So yeah, it is taking a while to sell properties. If I have priced right, marketed right, it should still be selling in that first 4 to 6 weeks, so if you’re getting to that 70 day mark, you really need to look at what you can do differently. The median house price, again started to dip up which is part of the reason why people were saying we’ve turned around. I’m saying we’re not, we’ve got at least another 3 to 6 months before we bottom out. You can see that the median house price did drop in that last July quarter and we’re now down at just over $530,000. 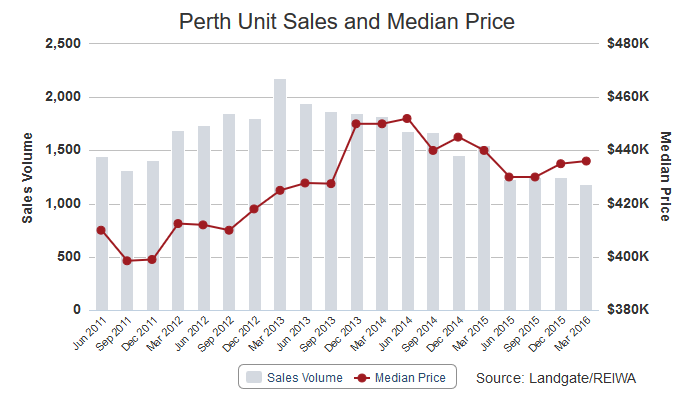 Units are backing the trend a bit and the actual median is showing a slight increase in price. However, I don’t believe that’s a true increase, it’s more because we’re having a lot of new apartments rush in to that market and slightly increasing the average median price that things are selling for. So, I don’t believe it’s reflective of growth just more that newer product coming through and getting sold. 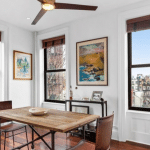 In the apartment selling space, we’re actually got a quite an oversupply and I suspect that once that stock has come on the market we’ll start seeing that decrease for a little bit longer before it bottoms. 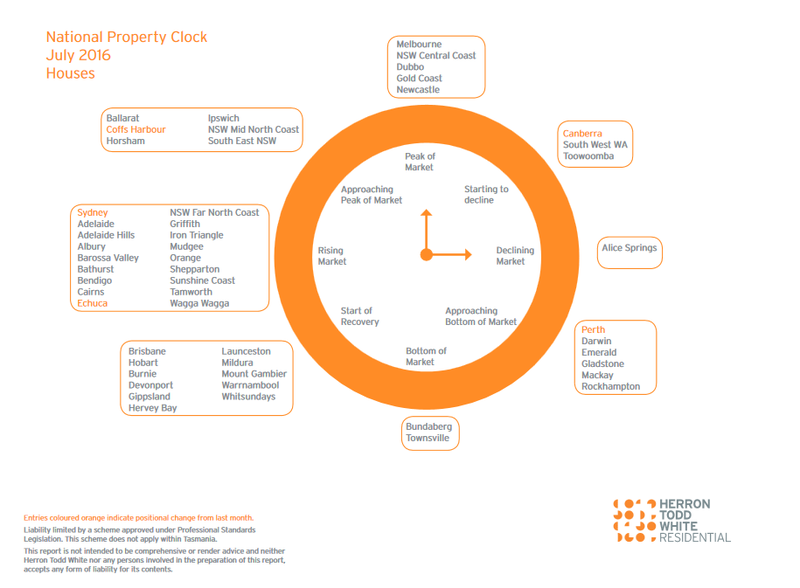 The Property Clock, I love looking at Heron Todd White’s research. 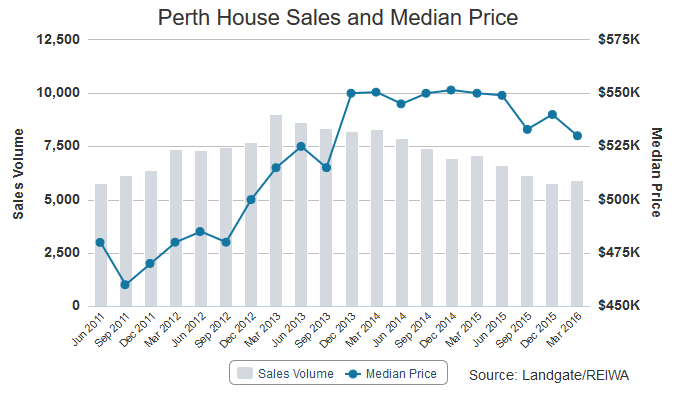 They’ve indicated a change to the Perth market that was starting to near its bottom. So that’s another kind of independent sign that we are getting there but I think it’s a little bit early to call yet. 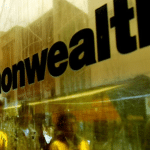 What I expect to happen with the flow of money around Australia… we’ve seen it before and I know different real estate agents in Sydney and Melbourne and Brisbane. What they’ve seen was that after Sydney & Melbourne had their growth, the money started flowing up to Brisbane and there’s a lot of activity into their market, so that’s fueling their growth. After Brisbane starts to come off over the next 6-12 months, the people that have gained in Sydney, the people that have gained in Brisbane will then start to flow the money back down to us. So that’s why I’m thinking that will be the kind of a tipping point for when we start to go up and trend again. So, a little bit longer till Brisbane reaches its peak and the money will start flowing our way then. Going into the Perth Rental Market, we do manage a 128 suburbs so I’ve got a fantastically broad view of things. And what the stats are showing us is that the number for rent, and I hate to be the bearer of bad news but the pain continues for landlords. We’ve had an increase since February in the number for rent by 15.7%. We’ve had a massive 34% increase since last year. 3-4 months ago, I thought it was starting to flatten but it just kicked up again and we’ve really got a lot of properties to compete with. So, my leasing specialist are doing an awesome job and you really do need a specialist when you’re placing and finding a tenant because normal property managers doing it and just getting eaten alive out there. And it’s not unheard of to have 2 to 3 months of vacancy, other landlords that are coming to us and frustrated with their current managers. We are generally re-leasing in 2 to 3 weeks but having to put a lot of effort and do everything as a sales agent would to get them away. The median rent, continuing to drop as the number of properties for rent goes up, that’s gonna continue to drive the median rent down, more supply with slightly decreasing demand and we’ve got a decreasing prices. So we’re now down at $380 per week, that’s decrease $15 since 3-4 months ago and look, I think it’s gonna go a little bit further before it bottoms out like the sale market. We’ve had a 5% decrease in that price since February 6 months ago and we’ve had a 9.5% decrease since a year ago. Finally, the vacancy rate, another great indicator, it’s up at 6%, it’s been holding at that point. We started to decrease, it’s marginally 3 months ago which also led some commentators thinking that the market had turned but now it popped back up to 6%. So, again, I think it’s longer to go on things. All of that might sound a bit negative but the flip side of the coin is that we are able to get some amazing buying opportunities both for home buyers and investors. And we’ve now gone solidly into each of the three types of properties which is something I’ve wanted to do for a long time. It’s taking us a long time to set this up so now we can offer Buyer’s Agency for Established, Buyer’s Agency for Development and we can offer New Investment Sales. And the reason that we’ve really gone into that is so that we’re not biased with what we’re recommending. 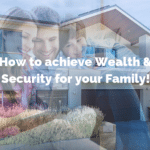 We’re looking at your situation, helping you look at your goals and you plans and then go the right type of property to seek your comfort zone and the money that you’ve got and what you want to achieve. So, we do offer a free strategy session to take a look at your situation. We do a rental and a sale appraisal on any properties you have. We also look to uncover any hidden potential we found. Some of our owners were sitting on sub-dividable and development sites without even knowing, that’s a great surprise to get. And we can just help you plan your next steps moving forward. You don’t need to be looking to buy now but many of our client’s realise after meeting with us that they can take a step to purchase if they wanted to. So that’s why having an external perspective and someone help you take a look at your strategy is so important. And one of the other new features I’ve released over the last week, we’ve had a lot of people subscribing to them is our new Buyer & Rental Alerts. 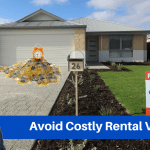 You can register the criteria with us and when we come across a property that suits that we list for sale or a rental property that comes up in our rental portfolio, we’ll be sure to let you know. 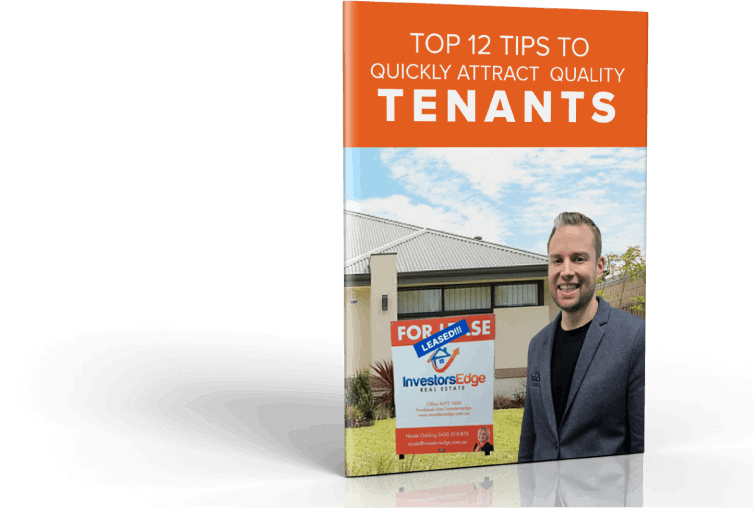 And the benefit of that is some of these properties are not even going to the open market, we’re gonna put that out to this priority alerts first and we’d of course love to keep our tenants if you are looking to move, we’d love you to move to one of our properties. So, thanks for joining my Property Investor update today. If you’re not already a member of my email list, make sure you go and join so you can get future market updates. And if you do need any advice on a situation for rental and sale, be sure to get in touch with me and we’ll get on to helping you with some input. Thank you so much. 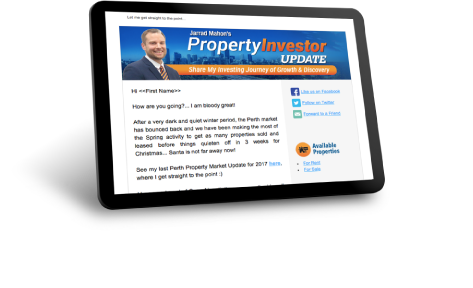 New members in WA’s rich real estate clubThe Average Perth Property Investor is Receiving a Better Overall Rental Return than 2 years ago! 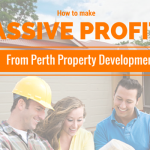 Me and my wife is looking to invest in property in Perth. We own our home and an investment property in Brisbane. 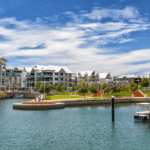 We are looking for a trusted and knowlegable buyer agent who knows the Perth market. Could you send us some information about your company services and client feedback. 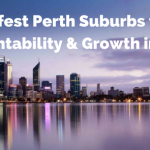 How many years is your company in Perth property market? 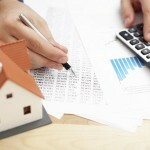 Are you afilliated with developers, real estate agents etc. 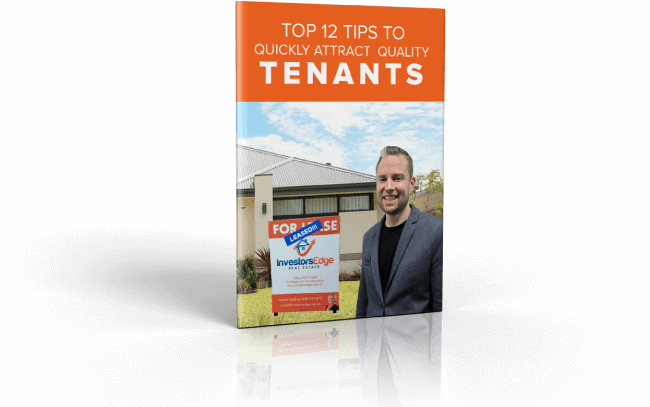 We have been in business for 8 years and completely focus on the Perth market with properties under management in 128 Perth suburbs… So we know what tenants want. 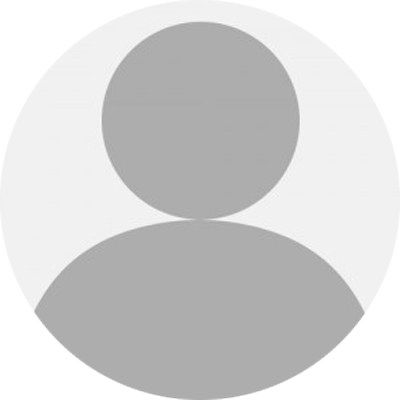 I will have Logan from our team get in touch with some more info on our buyers agent service to see if we might be the right fit for helping you.